Some buildings stop you in your tracks. That’s what happened to me the first time I walked by 1729 Vallejo, between Franklin and Gough Streets. Often referred to as Digby’s Castle, the complex of buildings evokes something out of Grimm’s Fairy Tales. Built into the hill, with a stone retaining wall forming a barrier to the private space beyond, it is a collection of small buildings, some constructed of a deep terra cotta-colored hollow clay tile. Set in a garden, the buildings dot the landscape, creating interlocking courtyards. While the buildings are small in scale, they still convey the feeling of a medieval fortress or castle. They were once the home and studio of Digby Brooks, a little known art-metal craftsman who worked in San Francisco from around 1910 through the 1930s. The site he developed had earlier belonged to his parents, William and Alice Brooks. A land agent for the Spring Valley Water Co., William Brooks apparently amassed quite a fortune before his death in 1916. Digby Brooks held a “real job” for only a brief period, serving as a salesman for the Machine Oil Co. Living off his inheritance, Brooks created his metalwork at his home and studio on Vallejo Street. Few of his works have come to light over the years; it appears most of his projects were used in designing his own home. However, the Wolfsonian Museum in Miami has in its collection a remarkable copper piece he created: a hammered and patinated copper tray with delicately pierced handles in the shape of butterflies. 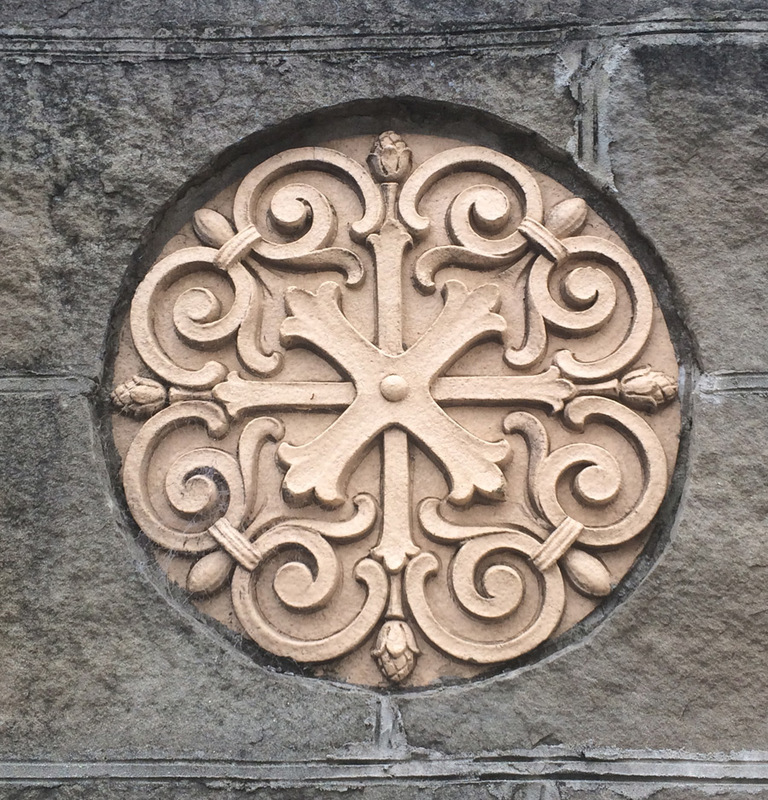 An artistic embellishment on the castle. Digby Brooks’s Vallejo Street folly was featured in a July 1922 article titled “A Studio Home of Thirteenth Century Design,” in The Building Review. The writer was particularly fixated on the fact that the buildings were only one year old, but had the charm and grace of years gone by. 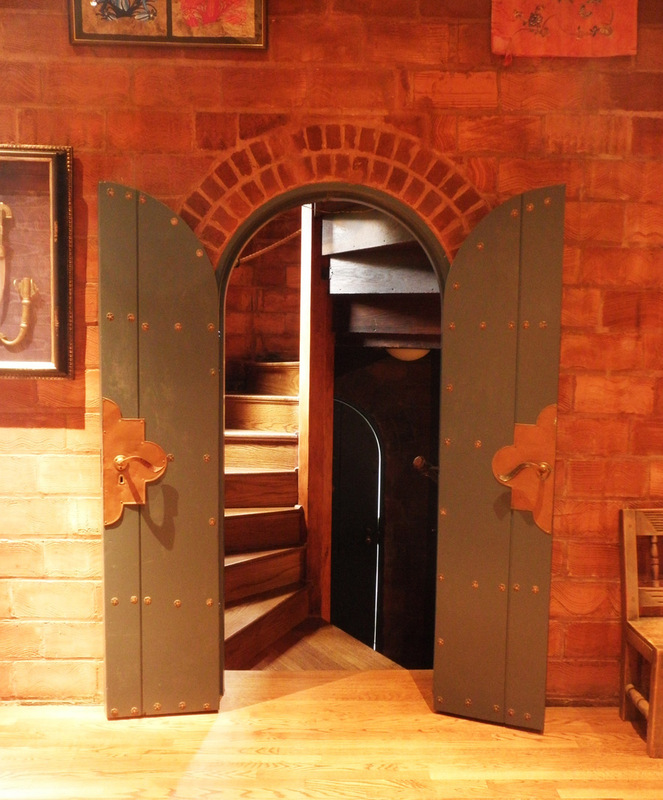 The doorway to the turret features copperwork by Digby Brooks. 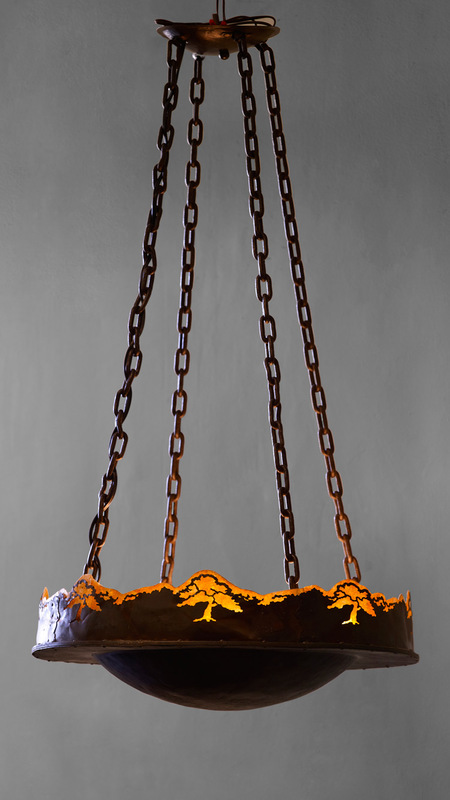 A hammered copper chandelier by Digby Brooks from the castle. Brooks must have demolished the house his parents owned on the site to build his castle. According to census records, Brooks was divorced by 1940. His Vallejo Street home and studio was worth $10,000. He was listed as a self-employed designer, with two lodgers, both salesmen, renting rooms from him on the site. When he died on December 22, 1947, Brooks was living at 226 Waller Street. Over time, the large lot facing Vallejo Street — originally 1717 Vallejo — has been subdivided and more buildings added. Now there are three separate lots, each with two structures. City records indicate that the lot containing Digby’s Castle has been further subdivided into two condominiums: 1729 and 1731 Vallejo. The unit at the rear, 1731 Vallejo, last sold in 2002 for $1.1 million. 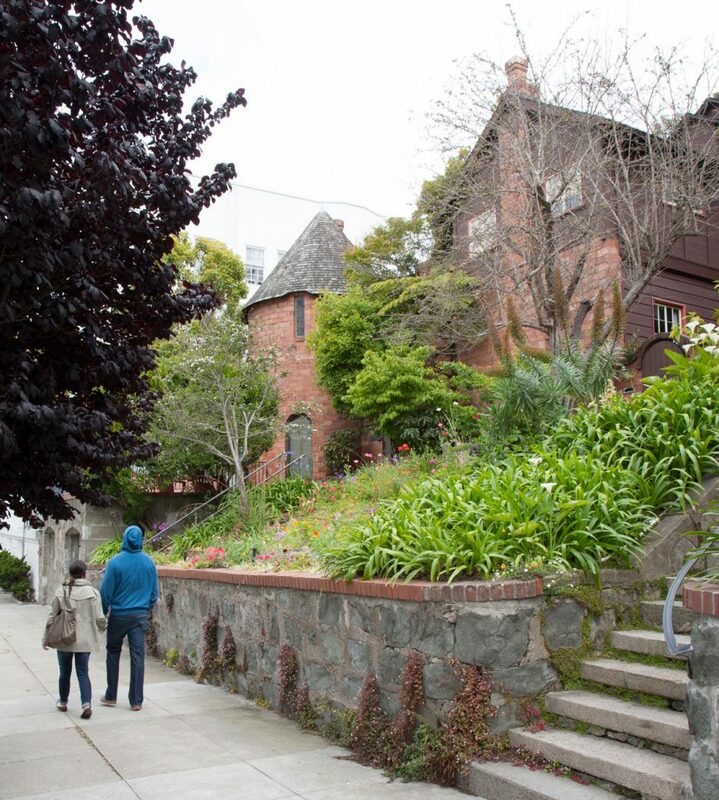 At the site, the stone retaining wall, two sets of stairs and the garages flanking the east and west ends form a unifying element along the street. The garden is especially attractive when it is in bloom, and there are still mature trees on the site. 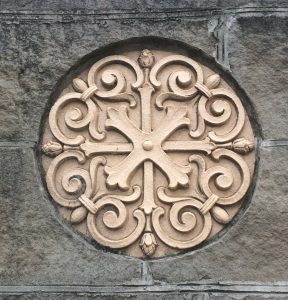 Brooks worked closely with Gutterson to design and place some of the interior fixtures, as well as most of the architectural ornament and hardware found throughout the house, inside and out, including the remarkable metalwork. A recent exhibition and accompanying publication, Bay Area Copper, shed some light on the significance of Brooks’s unique design work in metal, placing him in context with other metalsmiths of the Arts & Crafts era, including Dirk van Erp and Harry St. John Dixon, brother of western artist Maynard Dixon. Digby’s Castle is a one-of-a-kind urban complex — and worth a look on your next outing near Vallejo Street.